Approximately 40% of the world is at risk of Dengue (≈2.5 billion people). There are 50 – 100 million cases of Dengue every year. Almost 500 000 require hospitalization and 25 000 cases die annually. Dengue fever has been reported in over 100 countries in Africa, the America’s, the Caribbean, Eastern Mediterranean, South East Asia and the Western Pacific regions. Dengue fever outbreaks commonly occur in populated urban and residential areas of tropical nations. The disease is distributed along the distribution of the vector (agent that carries the disease). In this case, the vector is the mosquito (in particular the Aedesaegypti). The distribution remains 40˚North to 40˚South latitude. 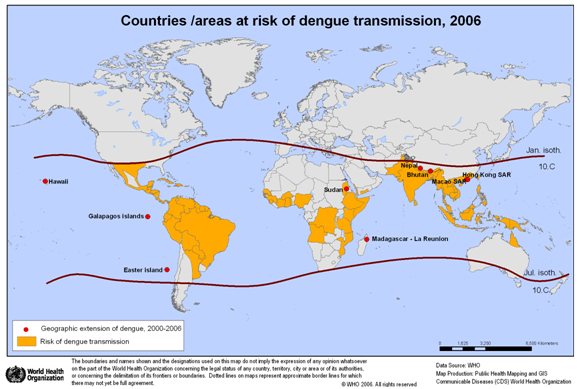 The yellow areas are where there is known risk of transmission of Dengue Fever. The red dots denote areas such as Hawaii, Galapagos Islands, Sudan, Nepal, Bhutan and Madagascar where Dengue re-emerged in 2000-2006 after many years of being in remission. 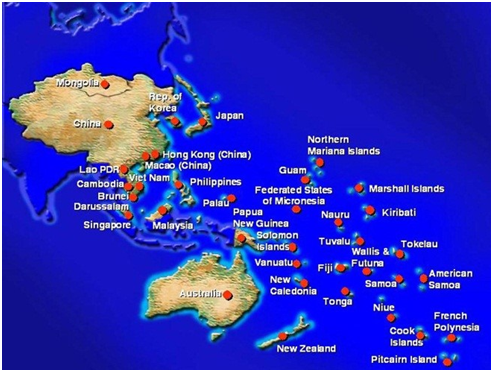 The region has been experiencing Dengue outbreaks before the 1950’s in countries like American Samoa, Cook Islands, Fiji, French Polynesia, Guam, Kiribati, New Caledonia, PNG, Solomon Islands, Tonga, Tuvalu and Vanuatu. Resurgence in outbreaks was documented from the 1970’s. French Polynesia, Queensland (Australia) and possibly Tonga are currently reporting DEN 3 outbreaks..
Fiji declared an outbreak in December 2013 and commenced immediately on its outbreak response that is not limited to enhancing clinical management of cases, monitoring the disease in affected and unaffected areas, increasing public awareness, prevention strategies, targeting clinical interventions, mobilizing community groups, government and stakeholders. Currently there is over 15, 446 suspected cases of Dengue notified to the Ministry of Health. There have been 12 confirmed deaths. About 10% of these cases in Fiji are hospitalized. The initial outbreak was centered in the Central division in December; it has peaked in the Western division with the Northern division showing an increase in numbers. Other viral illnesses such as West Nile virus. It is very important to consult a doctor if you are having any of the symptoms mentioned above so treatment can be received early and precautions taken to prevent others from falling sick. It is also important to protect oneself and family from the bite of mosquitoes. 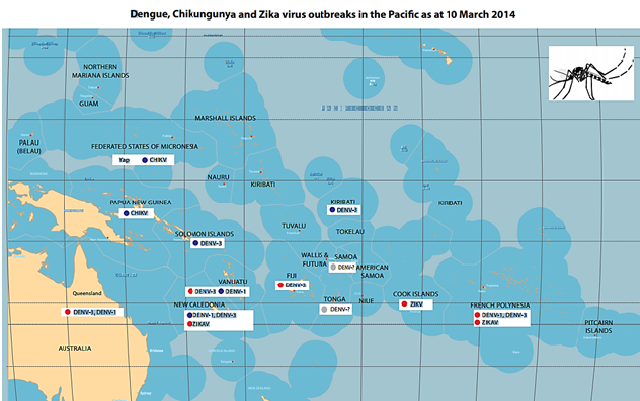 The Republic of Fiji is not alone in experiencing dengue outbreaks. Other countries in the Western Pacific Region are experiencing the same challenges including the more developed nations such as Queensland, Australia. Globally, the Americas, South East Asia and Africa continue to experience dengue outbreaks. The only effective responses are to work together, every individual, community and institution to reduce the breeding of mosquitoes by destroying man-made containers that breed mosquitoes, protecting ourselves from getting bitten by mosquitoes, protecting people suffering from Dengue from being bitten by mosquitoes and transferring the disease, and educating everyone around us in the importance of consulting a doctor when someone falls sick. Singh N., Kiedrzynski T., Lepers C., Benyon E. S. (2005). Dengue in the Pacific – an update of the current situation Retrieved from https://www.spc.int/phs/pphsn/Publications/PHDSurveillance/Surveillance-pages111-119.pdf.